Helmets, hi-viz and tax for pedestrians. In amongst the various ePetitions for making parking outside someone's house illegal, and for the many cyclist ones, making cyclist pay for the road, we are the only organisation to campaign for pedestrians to be better equipped for our cities. Cutting and pasting from someone else's proposal, we have one of our own. Some people will think we are taking the piss or something but not so: it's for their own safety. Look at this scene from the Stokes Croft/Ashley Road junction. A pedestrian crossing the road nearly gets hit by a taxi waiting for the lights to change in the middle of their road -past the ASL and not blocking it, we note. This taxi that manages to turn in front of the oncoming traffic by putting their foot down as soon as the lights go red & orange -and were it not for the pedestrian, would be on their way safely sprinting down the 20mph road to east Bristol. Probably no third party liability for damage caused to the front of cars. The taxi driver narrowly manages to avoid running them over as he accelerates down Ashley Road, and has to sound his horn to make them move faster. The tax-dodger seems a bit upset by this. Stop this menace to our roads! Everyone should sign our petition now! We have three signatures already! It's important to remember that our white vans are the lifeblood of the city. This is why we think the government should treat us like farmers, airlines and buses and give us tax free or tax discounted fuel. Here you can see FP54DYU doing both at the same time while finally escaping from the tangle of streets in Montpelier, here on Brook Road, where you can make the most of the 20 mph limit in a road with no wingmirrors to bump against. It's surprisingly hard to text one handed, so we hope the audience is impressed. The new Frome Valley cycleway follows the frome from the heart of bristol up to near UWE, with the first half along that jewel of the Bristol Road system, the M32 motorway. The fast moving traffic will remind cyclists that if they weren't so poor, they too could have a proper vehicle. Pharmacy Plus are proud to sponsor this new path. As a key member of the NHS supply chain, they recognise how important health and fitness is. The vehicle SF58PZK, which may well be associated with the company, is proudly placed in the middle of the path to remind people on foot and bicycle how much more accessible the city is if you have proper transport. Previously: Clifton. Today. Montpelier. We are going to show how the drivers in this part of the city not only know the width of their vehicles, but have far better situational awareness than other parts of the city. Look at this video here. The delivery van -whose way forward is blocked by roadworks- manages to reverse all the way back up the road to the next turning point. That is not something a normal driving test does, but it is hard. This person is skilled. After getting past it, the non-road-tax-paying cameraman continues on their way. Just as they are going past an expensive car, that car starts to pull forwards. We'd say pull out but in this road the pavement is about 1/3 of the actual roadway. That's why the driver of "NC53 BOV" didn't indicate; he wasn't pulling out. The cyclist, who appears to be somewhat committed to the pass and exclaims "wait" and pulls past them. This is insensitive cycling and shows inadequate situational awareness. The car driver isn't that happy with it, and after waiting a couple of seconds to get over the affront, sprints up fairly aggressively and puts some pressure on the bicycle to speed up. But he keeps his distance, there's nothing too threatening. Of course, driving half-on the pavement does limit your ability to put your foot down. At the junction, the driver pulls up alongside and there is a polite discussion. That's the difference between London and Bristol. In London: a fight. In Bristol a quiet exchange of views. The tax dodger explains that they are just trying to get to their destination alive. The driver of NC53BOV replies "try your best". The cyclist then congratulates them on their awareness of their surroundings and notes that they are more aware of them than the driver of CU54UWV. Then the troublemaker heads off towards St Werburghs. After giving the tax dodger a chance to get ahead, the driver of the Audi RS6 Quattro shows that a key benefit of the automatic transmission and four wheel drive is the ability to put your foot down and have the car react, bringing you up to 40 mph in a 20mph zone in seconds. They manage to get safely past the cyclist before the oncoming traffic has a chance to get close, and, after making up for lost time, continue on the rat-run to the St Pauls Roundabout. Notice that despite his earlier unhappiness, he gives the bicycle plenty of room. This is someone who knows how to overtake safely, is aware of their surroundings, and able to adapt to them. finally: bicycle wheeling is a crime! In Yate! We excited to see that even wheeling a bicycle is something that will be banned from the Yate pedestrian area! "The safety of our customers, visitors and staff is extremely important, therefore a decision has been made to ban cycles at Yate Shopping Centre with immediate effect. "We encourage people to visit the centre and to travel by bicycle. However, we would kindly request that cyclists utilise the ample cycle racks located around the shopping centre. We expect a noticeable increase in footfall when the new Tesco Extra store opens on October 24, so hopefully these new measures will prevent future issues and make the shopping centre a safer place for all shoppers." We expect this will rapidly improve the revenue in the shops and help it recover from the threat posed by the fact that Emerson's Green is five minutes drive away. Emerson's Green does welcome cyclists, so Yate should actually be able to market their Morrison's supermarche on this feature "Yate: nobody on a bicycle will be there". Tesco Supermarkets would like us to remind our readers that their shop in Cheltenham Road is accessible by people on foot, public transport, bicycle and car -the bus/bike lane providing the parking area for the latter. This video of Stokes Croft on a weekday evening is interesting. As well as the number of cyclists trying to along a road which clearly doesn't welcome them, most drivers are taking the collect "seize the junction" option here at the junction with Jamaica Street. Indeed, the yellow-hatching only covers half the road: its OK to block vehicles coming out of Jamaica Street, just not those going in. What is odd is that the car at the end, WR60VVG , doesn't take the junction, even though at list late in the cycle, there's a risk of the lights changing before she gets to go through. Admittedly, she has passed the lights so can't see them changing, but even so, why hold back? It's only as she goes past the camera that we can see why: she's on the phone. That's a problem that phone users present: they slow down the vehicles behind. If she'd been paying attention she would have gone through earlier, and another car could have come up behind. While she didn't suffer, another vehicle did. At 0:15 you can see some pickup -a proper vehicle- go through the roundabout and stop in front of the Cotham Hill traffic. That lets vehicles behind turn right, and ensures that the pickup driver isn't held up by anyone else. Of course, it does block that Cotham Hill traffic, so the usual "If you don't see them they aren't there" tactic kicks in: don't look to either side. What does the driver do. The phone would be a context switch and make them less responsive to changes in the road ahead. No, they do a better action: they eat their breakfast. There's nothing like a bacon roll and a bottle of cider for a breakfast on the road. Eating this way reduces the cost of congestion: instead of being stuck in the middle of the roundabout being "wasted" time, it is now useful. We think the drivers coming up the hill, instead of being unhappy about the driver's actions, should exploit this opportunity and have their own breakfasts. A Sunday in Clifton, and the owners of the 4x4s like WF58EZG are forced to use the raised body height to help get up on the pavement. There just aren't enough spaces for that VW Touran, or the Jeep Grand Cherokee WU53HGD below, famous for, in the words of the NCAAP safety tests, earning just two stars for pedestrian safety, "this car was not designed with pedestrians in mind"
Well obviously not. People walking take up parking spaces. Which brings us to Waterloo Street, Clifton Village. Bollards. Worse, Bollards with bicycles attached. Our Clifton councillors have done what they can to discourage cycling: resisting cycle parking in the village, proposing taking away yellow lines, but it isn't enough. It's not the yellow lines that are the problem -it is the bollards. They remove space from us, the important residents of the area, and give to them, the pedestrians and the cyclists. It's as if they were more welcome than us. Every Bollard is a sign that the War on Motorists continues! Some people think it's cute, but we know different. It's a new way to catch rioters. If every hour the police come up and put their name in along with the time, then if there's a riot all they need to do is go to the book, look at who signed it during the riot, and put them away for five year. It's the physical version of facebook. Indeed, it even has the work "book" in there, which is one of those concepts the Daily Mail want to ban, or at least burn. Fortunately YA55VDY is wise to these police tactics, and doesn't sign the book. For those readers who don't live in our fair city, it's about time we gave them a view of Stokes Croft, one that shows how it is the areas leading artistic and cultural quarter. Which it is. At least, provided giant grinning skulls painted by 3dom and Rowdy are things you can cope with. We feel for the people on Dove Street, who have that staring at them out their bedroom windows. How long do you have to live there before it starts talking to you? We got sent this video for review of an event at 09:10 this morning, just off Park Row. And what a lovely video it is. As you can see, the tax dodger descends St Michael's Hill then goes to the front of the road, waiting for a green light and then heading off along Perry Road with the goal of turning into Lodge Street and so descend to The Centre. While they are trying to do this, a road tax payer driving the premium Audi CF54UWV comes up Lower Park Row and starts to pull out. The tax-dodger expresses some concern here and then has to take evasive action by getting up on the pavement, before pulling in front of the Audi where he stops and expresses some more concern to the driver. The driver says "I'm Sorry, I didn't see you". We suspect that some more discussions would have taken place if the cars behind hadn't started sounding their horns -nobody died, no need for a post-mortem- so the cyclist sets off. The Audi is no longer behind the bicycle at the bottom, implying it has turned into Lodge Place and the office parking therein. The tax dodger then proceeds to make life hard for the car behind by giving way to other cars, rather than recognise that from their actions on the horn, they are clearly also important and in a hurry. The Tax Dodger is to be praised for wearing a helmet. The helmet camera, well, it provides entertainment. If they had waited behind all the cars on St Michaels Hill, they would not have been the first road user to approach Lodge Street. This would have reduce the risk of collision, as the taxpayer would have had something larger to spot. Furthermore, the MPV sounding its horn would not have been held up, as it was waiting on St Michael's Hill too -and would have been ahead of the cyclist. There is a small dotted line bike lane on Park Row. This would have caused the collision to happen earlier, and so not hold up the MPV. Getting on the pavement as a form of evasive action is illegal. If they had a registration number, they'd have been reported to the police for it. If they had been hit, their lack of third party insurance would have placed all the costs of repair to an expensive vehicle on that driver. After the incident, the actions of being nice to all cars pulling out was insensitive. They had already held up at least three important people who had paid for the right to be there; this just made things worse. If they hadn't been on a bicycle, none of this would have happened. We are also going to discuss the actions of the female Audi driver. Although playing the "I'm not going to look" gambit does help in some pullout negotiations, in this situation we'd have sounded our horn to make clear we were coming through. If you drive an old van you have better negotiating power. It's clearly a fast car, you could have looked at the bike, then done the same action aggressively enough that they wouldn't have caught up with you. Never, never, never say "I'm sorry, I didn't see you". Your insurance company will hate you for it, and in a world of universal cameras, your actions will be permanently associated with CF54UWV, Bristol and your apparent place of work, Lodge Place, for as long as google's servers retain the data. The correct thing to say in this situation is usually something like "get out the way, I pay for the roads and you don't". Sometimes we also demand they have insurance, though given our van's current insurance state, that would be a bit hypocritical. Speaking of insurance, we hope that the cyclist does not contact your insurers and provide them with some hard data on your driving techniques. That is one of the reasons why we do not insure our vehicle. Nevertheless: We in the Bristol Traffic Project salute the driver of CF54UWV for taking a personal stand against making Bristol city a safe and friendly place to ride a bicycle! Your single-handed actions should be celebrated! We hope that all other cyclists heading along this road -and there are clearly many of a weekday morning- will recognise that you are important and give way appropriately. Imagine a different world. No speed cameras, no traffic lights, cash back whenever you fill up your car. We can. The ABD can. "Hoverboard Hammond" can. And in Clifton, K33VYP is imagining a world without double yellow lines. A whole road has been blocked off and turned into cycle parking. Worse yet -a through route for cyclists, who could then endanger the paintwork of important cars, like K33VYP itself. This road blocking not only provides a parking area for visitors and residents, it takes away the parking opportunities nearby simply by making it so hard to get to them. There are proposals up to add some shared spaces in High Kingsdown, near the famous Highbury Vaults. This is the area that pops up in our Cornerish Parking article -one that already shows the area is half-way to being shared -it's OK to park in the middle of the road. The traffic survey is surprised about how low the traffic is. Well, it's a narrow road with narrow pavements to park on. Once the pavements are dropped to make it a shared space, we can park anywhere. This will increase the value of the road and so encourage more (motorised) visitors. Here for example, Oxford by the Primark. A shared space from which bicycles are banned. What shares it? Pedestrians and -in the distance- a delivery van. This is heartwarming; somewhere we can bring our van for a bit of shopping without fear of any cyclist damaging our door when we open it. As for pedestrian/van conflict, well -they get out of the way of the bus pretty sharpish, don't they? People email us and say things. A lot of things, most of which we can't print, as they assume the team are some group of bicycle-people. Not so. it is just that we don't film from our own vehicles, so have to send out "expendable tax-dodgers" to get footage for us. Why don't we film ourselves? This video from London shows why. It stops you being able to make and take calls with the camera phone. Holding a camera over a passenger while driving along makes it hard to maintain full speed, especially when you are hanging back to disagree with the cyclist. That's the worst part. Your own video can be used as evidence against you. As for the whole nature of this dispute -the tax dodger wing-mirror-taxing the smart car as it pulls out into his lane, well, if you have wing mirrors, you aren't a proper Bristol driver -a fact which the very presence of wing mirrors radiates to everyone nearby and puts you at a disadvantage in all right-of-way negotiations. Anyone thinking of visiting the city -just stick some duct tape round the mirrors to create that local-driver look without having to actually do Richmond Road, Montpelier, at full speed. Shocking footage reaches us of this, Old Ashley Hill, in Montpelier, where someone has placed two flowerboxes on the pavement outside their front door. So what? people say, In the background there are two cars on the pavement, X385MJW and WV07YVZ, taking up space. Why worry about the flower boxes? Places or leaves any furniture, goods, wares, or merchandize, or any cask, tub, basket, pail, or bucket on any footway. The flower boxes: criminal. The cars: doing what needs to be done. We shall report them to the police. Incidentally, the law also makes it a crime to "Slaughter any cattle, except in the case of any cattle over-driven which may have met with any accident", and also clarifies that "The word “cattle” shall include horses, asses, mules, sheep, goats, and swine". This is going to cause problems in Kingsdown when they next sacrifice a goat to Elder Gods in the midwinter festivities. They shall have to make sure that the goat is slaughtered in the road, and perhaps move the Wicker Man to Freemantle Square, otherwise they too will be in trouble. Our recent coverage of Clifton has generated more contributions from the area, and here we are pleased to show some photos from "G", showing the imagination that the locals are forced to apply to the area's parking problems, as all the councillors can think of is removing a few yellow lines under the guise of traffic calming. These photos actually introduce a whole new concept, here in Hurle Road, Clifton: PaveClaiming. First, what's that in the distance? A car on the pavement, poking into the road. Nothing unusual there -even in Clifton. Lots of people don't have driveways big enough for six big cars. 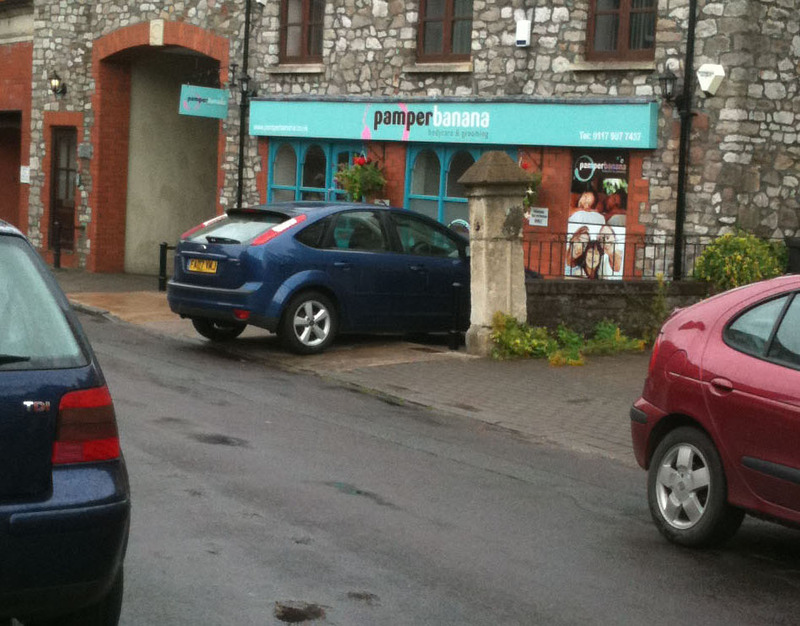 When you get closer, you can see it's not a house, it's "pamperbanana", a body grooming shop. Offering "A fresh and vibrant welcome awaits you to indulge in one of the many luxurious treatments" Again, nothing too unusual. Our favourite Stokes Croft massage parlour has a vibrant welcome allowing us to indulge in one of the many luxurious treatments -and dedicated bike lane for us to park in "when we're in a hurry". That's why we call it PaveClaiming. "The act of claiming ownership of a piece of pavement so that only you can park there." Nice. Given the nature of Clifton, you can't expect residents to walk or cycle to the salon, so this is what the team had to come up with to encourage visitors. Sadly, not everyone seems so positive about the idea. The council planning department appear to be investigating the apparent change of use of the front of the establishment. This worries us. You can't call PaveParking a change of use -it's as traditional to Montpelier as getting drunk and having a fight on a weekend evening is in The Centre. No permission needed there. Hopefully it's just the PaveClaiming that they are worrying about, not the actual paveparking. That would threaten the stability of whole regions of the city. There's a lot of complaint from the bicycle-troublemakers, the vocal ones, about vehicles stopping in ASLs. We think that it's exaggerated. Here is our proof. [update]: It's apparently a Wessex Connect Bus. We praise them for their consideration. It's a video from (an expendable) cyclist. As we've stated before, we don't video our own driving in case it is used in evidence against us. Even the soundtrack of us trying to touch-type facebook updates on the phone could cause legal issues. Hence we give these tax dodgers cameras "as gifts" and collect the output. Today we see the output from a shinier camera, which is helmet mounted for a bit more stability. This video was shot going down Shaldon Road, meeting the lights at Muller road. As you can see the bus has its wheels behind the ASL, but the front of the vehicle is in the ASL. This is for everyone's own good -nobody should go into this ASL. 0:13. The bus gets a green light to turn left, taking up most of the lane as it swings round. A cyclist may have survived if far enough to the right, but the turning car would have dealt with that. 0:22 The cyclist gets a green light and starts to head through while a car coming from the M32 runs the recently-red at speed. If the cyclist had been using the ASL for its planned purpose "getting out early", they'd have been hit by that car. The FirstBus WessexConnect vehicle's positioning not only protected the cyclists from it's own left turn, it saved ithem from other road vehicles. We think this is one of the cycle facilities which even the militant cyclists would be campaigning to remove. Speaking of cycling facilities, we are disappointed to note that Lord Mayor Geoff Gollop will be in Stockwell to proudly open the new "pump track" put in for the local teenagers to cycle round. Why the disappointment? Well, that's only going to encourage them, isn't it? We feel betrayed. Why? Cllr Gollop was the leading quote for the Bristol Bikelash. How can he rightfully take our side by denouncing the painting over of some parking spaces with bike lanes, then turn around and say "it's OK for people to cycle here". It's just hypocrisy. We know he's going to drive there, obviously, but will he stand up and say the truth -that he and his party are the only people prepared to stand up against cycling and public transport in this city, because they are the only form of transport for poor people, and we are not poor. Well, not poor yet, though his colleagues in Westminster have plans for that. But don't worry: the unemployed don't commute. Luckily, the entire Bristol Traffic project is based in Clifton, where sights such as this are rare, even on double yellow lines. We feel sorry for this poor driver, who has accidentally visited Cotham, and become ensnared in its Resident's Parking Zone. Three tickets in as many days. With the registration EX11WVT, it's quite possible the driver lives in Essex, and may not be aware that it's always better to park in Clifton, rather than Cotham, especially if intending to stay in Bristol for a few days. We've heard sob stories about people having to go without food to keep their cars fueled up, but nobody has looked at the impact on the tradition of motorbiking to your mates to a pub. Not only are road taxes and petrol taxes on the rise, but beer taxes have gone up too. This is a group of pub goers have been forced to cycle to the Vittoria on Whiteladies road pub for their afternoon beers; a row of chopper style pedal cycles lined up as a forlorn statement of a lost dream. Still, it adds to the beer money. Looking at the zebra crossing, we can see someone didn't quite manage to make the corner here. At least that's one good thing of the plastic keep-left signs: they bend out your way and don't damage the paintwork. This is the zebra crossing that the WoEP wanted to move away from the road crossings as part of the showcase bus route. Whatever the claimed reason, the real reason is now becoming clear: Tesco are putting in a mini-mart where the Texaco garage used to be. As we've seen elsewhere in the city, a zebra crossing provides excellent short-stay parking opportunities for anyone nipping in to buy one or two items. Not petrol bombs though, as that bit of the site will be going away. Anyway, who could afford them? The elusive "Bristol Citizen" asked us why we forgot to mention anarchists as the cause behind the riots. Good question. It's hard to see theft of LCD televisions as somehow aligned with the Anarchist cause. Indeed, it's hard to see a complicate blackberry-and-facebook based Command-Control-and Communication Infrastructure being operated to co-ordinate such thefts. Sitting in a pub like The Hare on the Hill cheering on rioters out on ninetree hill -that we can accept. Planning a mass rising of the population in Croydon. Unlikely. Croydon? It's not exactly the Bastille or the Battleship Potemkin, is it. If you are going to plan a revolution, pick somewhere dramatic to be celebrated in cinema and art for centuries. Not Croydon. Who then? Well, we also forgot to mention Rave Music. - music described in the 1994 Criminal Justice and Public Order Act as "sounds wholly or predominantly characterised by the emission of a succession of repetitive beats". A music so dangerous that they had to ban rave gatherings, out of fear of groups of people wearing lime green t-shirts dancing to A Guy Called Gerald threatened society -or at least the alcohol revenue of clubs, pubs and national supermarket chains. There's another issue: where did all the balaclavas come from? There's only one group of people who go round the city with Balaclavas and facemasks, geared up for a mass uprising and already showing an affectation for consumer toys. Yes, the cyclists. With the face gear, the fingerprint-protecting gloves and the riot-ready helmets, along with the nimble wheeled subversion-mobiles, these are the real criminals in our society. What to do? The obvious answer is to show that we aren't intimidated, to place our range rovers firmly in the cycle paths and say "we will not be intimidated!" Praise L008YXR for being the first of the true citizens of our streets to drive over to the bike paths of Montpelier and show they are not afraid. Already you can see how the passing cyclists look threatened and unhappy! Tesco would like to us to remind you that they are still open.